I love my pugs but sometimes they drive me crazy. I used to have a pretty bad temper which has calmed down for the most part but sometimes I just lose it and throw a temper tantrum. Last night I fell asleep on my couch because I've been tired and stressed at work. I woke up at 2am, exhausted and cranky. I hurried to take the girls out for what I thought would be a quick pee. I was wrong. Rosy did everything real fast, but Sunny refused to do anything and would barely move. After standing outside in the freezing winds, with my legs and fingers going numb Sunny started circling and then pooped. I totally didn't expect that so then I had to fumble with opening the poop bag all while angrily whispering "Come on, pee! Pee! Pee! Do your business!" The bag flew away and Sunny tried running back to my apartment and I just felt so tired and cold, I did an angry stomping dance, blinking away tears of frustration. Luckily no one was outside at that crazy late hour to witness me losing it like a little kid. After a couple more minutes Sunny finally peed and we all ran back inside and tried to get a few hours of sleep before we'd have to wake up in the morning. Not my proudest moment of course but at least I can look back on it with humor. Seriously, I am done with these freezing temperatures, crazy wind chill, and poop AND pee strikes by Sunny. Can I give you a high five? 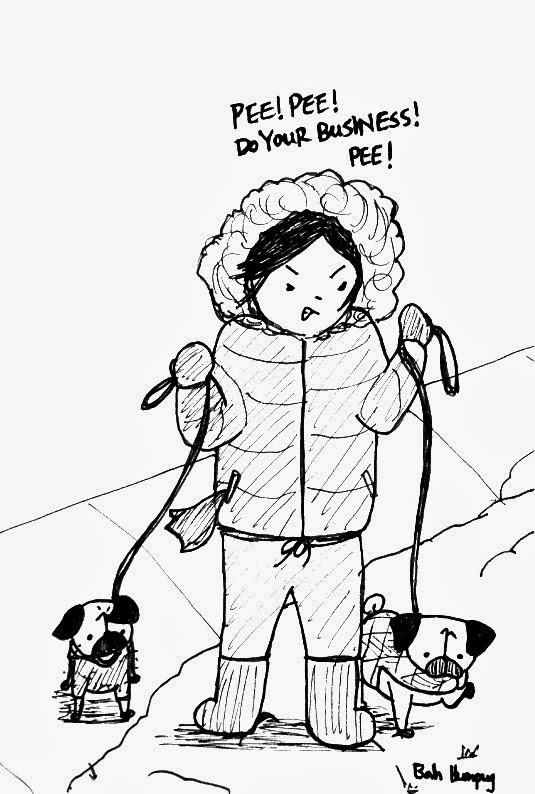 Ralph and Max, our two pugs are notorious for stalling on the pees when it's freezing and I'm exhausted. I hate to tell you this, but as they age, it gets worse instead of better. My Max takes FOREVER these days. He sniffs individual blades of grass and I think his goal is to eventually sniff each one. He doesn't see too well and hears very little, but his sniffer still works. Anyway, I'd like to say that I'm patient and understanding, but it depends on the day. Some days I just yank at his leash and say peee, peee, peee, the same as you!